In 1765, Blackstone published the first of his four volumes of Commentaries. 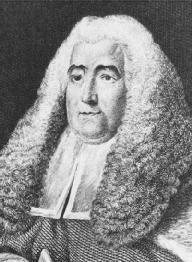 The treatise discussed the cases, rules, and legal principles outlined in his popular Oxford lectures. Each volume concentrated on a particular area of law—personal rights, property rights, torts, or Criminal Law. As Blackstone analyzed the laws, he also revealed their relationship to a higher power. Throughout his Commentaries, Blackstone wove the concept of "natural law,"or God's laws imposed on humankind.